Chris Matthews’ “Hardball” delivered one of the most revealing moments on cable news in years on Tuesday when he asked DNC Chair Debbie Wasserman-Schultz what the difference is between modern Democrats and socialists. She literally refused to answer the question. The spokeswoman for the DNC could not give an intelligent answer on what separates Democrats from socialists. Wasserman-Schultz: The more important question is the difference between being a Democrat and a Republican. Matthews: But what’s the big difference between a Democrat and a socialist? You’re the chairman of the Democratic Party. Tell me the difference between you and a socialist. Wasserman-Schultz: The difference between a Democrat and a Republican is that Democrats fight to make sure that everybody has an opportunity to succeed, and the Republicans are strangled by their right-wing extremists. The look on Mrs. Wasserman-Schultz’s face when Chris Matthews asked her to differentiate modern Democrats from socialists spoke volumes. It was as if she were locked in a room with a man whose stomach was well into its way of processing a dozen rotten eggs he had eaten hours before. Republicans are “strangled” be “extremists,” and yet the DNC chairwoman can’t tell a cable news host the difference between a Democrat and a socialist. Classic. Ask yourself this question: If there was such a “huge difference” that wasn’t elucidated for Chris Matthews’ audience, then why did he move on to another subject instead of explaining it to them? The answer is that a “huge” difference does not exist. Years ago I had a job that allowed me to travel all across the country talking to people about public policy issues. There were often older men and women at these events who really seemed to believe the Democratic Party was still one that would welcome a man like John F. Kennedy. As the DNC chair’s non-response demonstrates, those days are over. The sad truth of the matter is that the modern Democratic Party essentially sees no area of American life that should be shielded from the bureaucratic bombardments of an ever-expansive federal government. The modern Republican Party is filled with spineless men whose jiggle-jowls wobble back and forth while they play lip service to the virtues of limited government, but little else. The American people get what they deserve, and right now we deserve Debbie Wasserman-Schultz leading the DNC and Donald Trump leading in the polls. If that doesn’t tell you all you need to know, then it is highly likely that you were a key player in creating the political climate that now exists. The notion that the United States is or strives to be a purely capitalist society is a naive fallacy. There have been elements of socialism in our socio-economic structure ever since the Lincoln Administration (progressive income tax), more were incorporated during the FDR Administration (components of the New Deal), again during the Eisenhower Administration (the Interstate Highway System), and again in the 1960s (Medicare). The notion that the United States is or strives to be a purely capitalist society is a naive fallacy. It’s interesting that you mention fallacies since the very first thing you did was dish up a straw man argument with a red herring glaze. This isn’t a conversation about the ideological concessions that 535 politicians — from across the political spectrum — must make as they try to craft public policy. This is a conversation about the ability to articulate the difference between what it means to be a Democrat and what it means to be a socialist. Regardless, thanks for taking the time to read and comment. I appreciate it. She couldn’t really answer the question without alienating one faction or another within her own party. Some Democrats are socialists, and others are willing to go along with a socialist agenda in exchange for what they want re: issues that are important to them personally (like forcing a bakery to prepare a customized cake for a gay wedding). I mean, can you even imagine Obama, Clinton, Pelosi, George Clooney, Sean Penn, Barbra Streisand, Gwyneth Paltrow, or any of that crowd living in a co-op, working in a blue collar job, serving in the military (or VISTA or the Peace Corps), or using public transportation? Wasserman-Schultz is probably right, though, in saying that the relevant question is the difference between the Democrats and Republicans. Those two parties are the only choices. We have 50 or more contestants for Miss America, but never more than two viable presidential candidates. I’m not a huge fan of Sean Penn (i.e., the guy who wishes his political opponents get rectal cancer), but I think he has done some legit work in 3rd world countries. I think the others you mentioned are much more comfortable chortling with each other over aperitif wine at swanky political fundraisers. I can answer that! The difference between a socialist and a democrat is that a socialist actually knows he’s a socialist. With a democrat, you’ve just got the blind leading the blind and trying to make stuff up as they go along. If you have not read Whittaker Chambers’ “Witness,” you may want to add that to your list. He talks about his tenure at Time magazine and the editors who were incredulous when he told them they sounded like communist spies he once knew. That’s sort of the point, though — Chris Matthews is old enough to remember a time when his question would not have been seen as a “don’t bite” story. He worked for Jimmy Carter and Tip O’Neill. He is a loyal Democrat, but he is troubled by its evolution. Mrs. Wasserman-Schultz says that it is Republicans who are “strangled” by extremists, but Chris Matthews knows that it his own party that is choking. Every so often the mask slips on Matthews and it is clear that while he is a partisan hack, he is uncomfortable with just how far to the left his Democratic Party has lurched. As a side note, I am constantly amazed at how the DNC could put someone who is such an intellectual lightweight in such an important position. 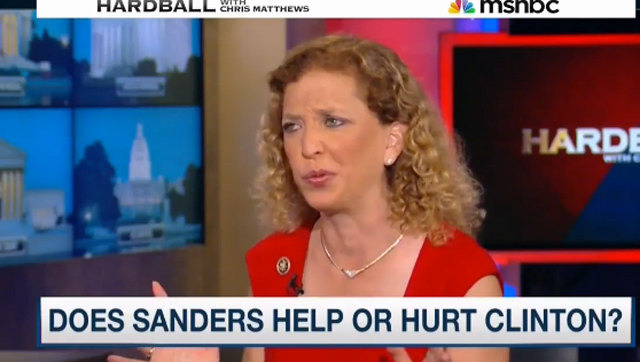 Play the video and watch Wasserman-Schultz’s brain freeze when she is asked that question. If she were a laptop then she would have needed to be rebooted after that question. That was embarrassing. I suspect Matthews sees Sanders as a sure-lose candidate, and really wants the DNC to steer the party away from his type rather than coddle and coo to them. I love how hard-core liberals once gravitated to the young cool black guy and now eight years later they’re enamored with the crusty old white guy. I wouldn’t mind, but they’re the ones who are obsessed with painting old white men as inherently evil because they’re old and white.